But when you have a dog this cute...what is a girl to do? But enter her into a doggy costume contest!?!? 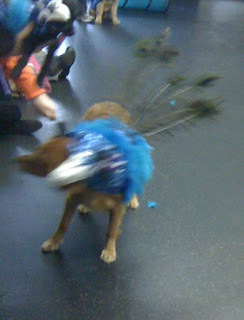 Sunday afternoon we took Punky and her friend Daisy to a doggy costume contest on Grand Avenue. 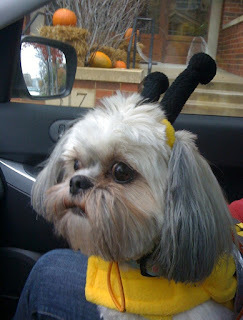 Daisy dressed as an adorable squirrel, holding a nut, and her buddy, Punky, dressed as a Bumble Bee. Well I know I talk a lot about my dog, but the truth is that I love ALL dogs. I do not discriminate, big or small...I love them all. And at this costume contest, there were some of the world's cutest dogs. 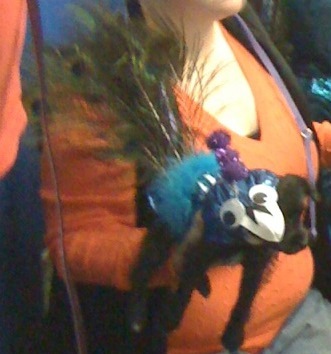 And let's just be honest, the type of person who would bring their dog to a costume contest, and in most of the cases (besides Punky and Daisy), MADE the costumes from scratch...well clearly I wanted to be there to see the crowd. My mom has this theory that people subconsciously choose dogs that look like themselves. Well I wish I had been quicker with the camera, because this event was no exception. Here are some of the standouts of the afternoon. Pardon the poor photography, these puppies moved fast! I mean honestly? Have you ever seen anything more hilarious/adorable/frightening/cute in your life????!!!! A very blurry princess. 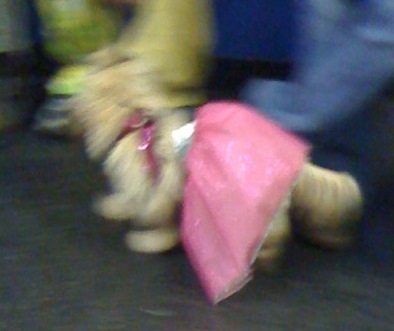 Here was a Shih Tzu dressed as a princess, tu tu and all! The dog Mom? pretty much looked like she ought to be wearing a tu tu as well. 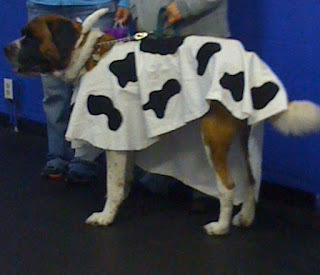 Now I have had a special love of cows all my life, so here is my personal favorite....The St. Bernard, dressed as a cow!!! To die for. Punky adored this dog. He literally flipped her on her back and she just sighed with glee. Clearly she loves cows too. 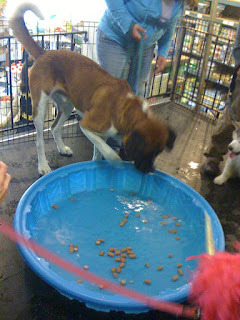 And finally, after the costume contest was judged, the contestants were able to go bobbing for hot dogs in the kiddie pool. The St. Bernard loved it. Ate most of the hot dogs. Punky was scared. But stuck around because her buddy, the St. Bernard seemed into it. But you cannot pay for that kind of entertainment. You should have seen the mother of the Golden doodle pooch, with the worlds biggest, frizziest blond hair. I swear, she and the dog were cut from the same cloth. And the Golden Retriever dressed up as a Mexican working Burro, whose mom looked like she had just removed her own poncho. Oh....and the Maltese, dressed up as a pirate, whose parents looked like they had smelled something bad, their noses were perched so high in the air. A fantastic afternoon. I recommend you dress your pet, or child in a crazy costume. Our parents did it to us when we were young. Now it's your turn.